Better Explained isn’t an authority lecturing you on facts: it’s an excited friend sharing what actually helped when learning. I don’t want to give the impression of some all-knowing reference — it’s a journey of discovery. The layout is new and kinks are likely — let me know if anything is off! So wonderful to read your work Kalid, as usual! I love the new look, although I can’t imagine how you could be more friendly, warm, readable, than you already were! …and the time as I post is NOT 3:48 in the morning, just in case that makes me look a bit strange, it’s 7:48 in Mtl! @tasnim: Thanks! I just fixed the layout. This is such an awesome site! I tell more and more friends about it everyday! I’m a physics student and it’s really motivating to read about new ways of thinking about ideas that I’m expected to know by heart! I hope you can do this forever, haha. Keep up the good work, it’s much apprecaited! @Brandon: Awesome, really glad you’re enjoying it! (And thanks for helping spread the word :)). I’d love to keep doing this for as long as I can! What are your credentials? College degrees? 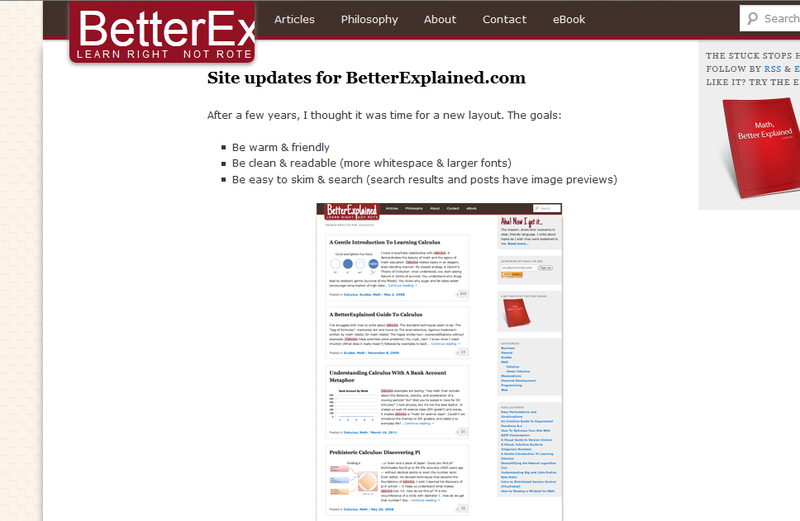 @Kevin: There’s more about me on the about page (http://betterexplained.com/about/). Though I’ve done a lot of schooling for math, etc. that isn’t necessary to write about or enjoy the subject! on a PC in Chrome at 1024×768 screen resolution it looks a bit off centered, but otherwise love the new layout!!!! @Aerodyno: Thanks, will have to check it out! Thanks Anne! I think it might be an issue with the font not downloading properly, appreciate the bug report! Finally, the design match the content of this awesome site.